Earlier this week, a tVM subscriber pointed me to the official website of Tom Shadyac’s film “I Am.” How or when I will see it, I don’t know, but I WILL see it. The trailer grabbed my guts and the final statement struck with power: “We started by asking ‘What’s wrong with the world,’ and we ended up discovering what’s right with it.” A bold enough statement to steer me to the film with the thought that if we amplify what’s right in the world and diminish what is wrong with it, we can move humanity in a very positive direction. Other than the trailer, I know nothing about the film. It may be lousy, but I am going to find out for myself. That final statement called to mind a young girl trapped in a world of despicable hatred, loathing and misery. Despite her surroundings, she refused to dwell on the bad in the world and always chose to look at what is right in the world. In her short life, Anne Frank set an example for every human being to follow. Anne Frank is a hero. Born in Germany, Anne and her Jewish family moved to Amsterdam when she was four-years old. When the Nazis occupied the Netherlands in 1940, the Franks were trapped. 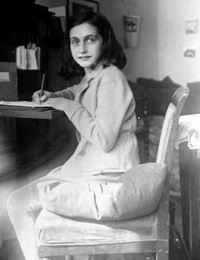 They went into hiding in 1942 and successfully evaded discovery for two years, but they were betrayed in 1944, and Anne Frank, just fifteen-years old was incarcerated at Auschwitz and later moved to the concentration camp at Bergen-Belsen where she died of Typhoid in 1945, only weeks before the British liberated the camp in April 1945. Her father Otto was the only member of the family to survive the camps. After the war, he returned to Amsterdam and visited the family’s hiding place. There, in 1947, he found his daughter’s diary. It was first published in 1950 as Anne Frank: the Diary of a Young Girl. Anne Frank’s entry on Wednesday, February 23, 1944, just a few short months before she was taken captive by the Nazis should be mandatory reading for the human race. “As long as this exists,” I thought, “and I may live to see it, this sunshine, the cloudless skies, while this lasts, I cannot be unhappy.” The best remedy for those who are afraid, lonely or unhappy is to go outside, somewhere where they can be quite alone with the heavens, nature, and God. Because only then does one feel that all is as it should be and that God wishes to see people happy, amidst the simple beauty of nature. as long as this exists, and it certainly always will, I know that then there will always be comfort for every sorrow, whatever the circumstances may be. and I firmly believe that nature brings solace in all troubles. Please take this reading to heart, and please pass it on to all the people you know. Let this be a cause to lift your spirit and to help you lift the spirits of those around you. You will be more clever than I at ferreting out the “I Am” movie. I felt it is a must see too after seeing Thomas interviewed on Oprah. If you run across where I can purchase it, please let me know. Have had much empathy for the Jewish people for quite some time. Not sure that I ever read Anne diary though. Another story of how one can transgress suffering at the hands of another and move into a much closer relationship with oneself, with God, with humanity. ’tis only miraculous and of God Himself. If you folks have a Kindle, if available, try “An Interrupted Life” by Hetty Huelsman ?SP? It is also a diary, but she was 26-27 years old at the time, She tells of the days before, during the ghetto, and the final days before being taken away. I appreciated her account as she was older, more of an intellectual journalist type. I buy books and can not find my copy ! I just read a short piece that suggests the “I Am” DVD may be available by Christmastime. I’ll follow it and keep you advised.